Local teenagers have been rewarded for their hard work and the environmental knowledge they gained in preparing for this year’s Massachusetts Envirothon, held on Thursday, May 12th at Hopkinton State Park, Hopkinton, Mass. The top scoring teams in the outdoor field competition have been announced. For the past school year, high school students across the Bay State have been studying soil, water, wildlife and forestry, as well as researching the role of human activity in the spread and control of invasive species as they participated in this environmental education program. At the event, teams rotated through four “ecostations” where they answered written questions and engaged in hands-on activities such as soil analysis, wildlife habitat assessment, tree identification, and water quality measures. Each team can have up to 10 participants who split into specialized sub-teams during the competition, each focusing their efforts at different ecostations. At the fifth station, the Current Issue, each team gave a 15 minute presentation on “Managing Invasive Species” to a panel of judges. Teams researched the Current Issue in their own community in preparation for their presentation. Judges included environmental professionals from government agencies, non-profit organizations, academia and private industry. Teams were asked to assess the effects of invasive species in their community and to recommend steps that their city or town and individuals, including young people, should take to address the issue. “The Envirothon not only increases awareness of significant environmental issues, such as the spreading of invasive species, but most importantly, it engages and challenges young minds to think and prepare for possible solutions for future generations,” said Matthew Beaton, Secretary of the Executive Office of Energy and Environmental Affairs. 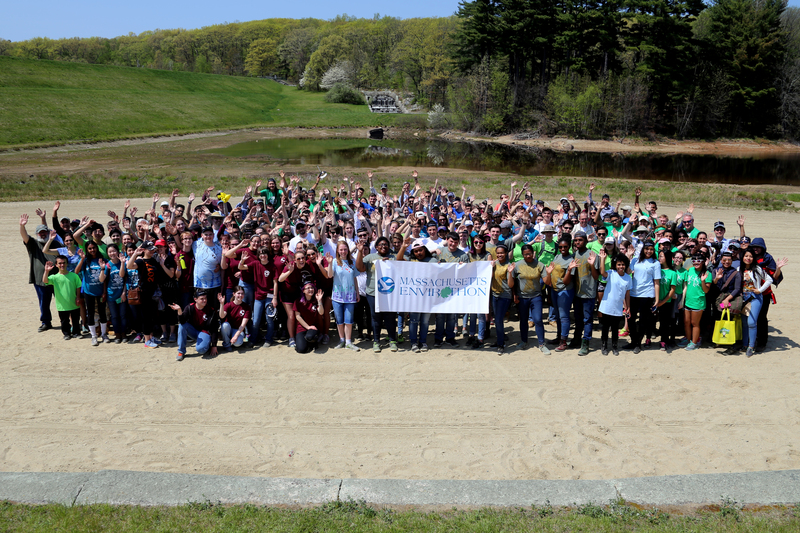 The 2016 Massachusetts Envirothon is made possible through the contributions of partnering agencies and organizations, including financial support from the 2014 Massachusetts Environmental Bond Bill, the U.S. Forest Service, the Massachusetts Grange, Environmental Business Council of New England, Wegman’s supermarkets and local conservation districts. Fifteen federal and state environmental agencies, conservation districts, non-profit organizations, higher educational institutions, and businesses provide expertise and help organize the event. Dozens of volunteers will also be on hand on May 12th to handle all the event logistics from setting up tents, tables and chairs, checking-in teams, serving food, scoring tests and cleaning up. great work! congratulations to all the winners!! !